Bethel Lutheran Foundation provides independent living options for the elderly. These living settings seek to enhance independence through providing a homelike setting in a congregate living arrangement. The units provide a complete kitchen, dining and living room setting. One and two bedroom units are available. The units are no pets and smoke free. 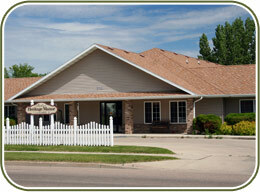 Call the Foundation at 701-572-0223 for information on availability. The Bethel Terrace occupies a three story building with elevator access and houses 15 two-bedroom units and 2 one-bedroom units. The building also features a community room, hot water heat, wall air conditioning, patio, on site laundry, off street parking and 8 garages. Rent at the Terrace ranges from $435-$635 per month including cable TV, heat and water. Tenants are responsible for their electricity and phone. Garages, when available can be rented for an additional $50 per month. Meal service is available. The Golden Estates are a 16 unit senior preferred complex locate at 56 West 22nd Street in Williston. The two bedroom units include full kitchens, laundry hook-ups, wireless internet and two meals a day served Monday through Friday Rent starts at $1,276 which includes the meal plan. The Bethel Heritage Estates consist of 9 two-bedroom, ground level units. Each unit features a patio, garage, storage room, full kitchen, and laundry room. The common area hosts a pool table and several card tables for use by tenants. Tenants at the Estates also have access to an exercise area, community kitchen, library, spa, barbeque grill and garden court area. Rent at the Estates is $993 per month including wireless internet, utilities and garage. Tenant pays for their own cable TV and phone. The Bethel Heritage Manor houses 8 two-bedroom and 12 one-bedroom units. All units are ground level with no steps. 2 bedroom units come complete with a full kitchen, storage room and laundry room. There are also 10 garages available to tenants. The Manor's lobby area hosts a library, kitchen, dining area, outside patio and inside garden court. Tenants also have access to an exercise area, pool table, card tables and spa. Occupancy at the Manor is based on income eligibility with rent ranging from $595 - $751 per month including utilities, wireless internet and garages when available. Tenant pays for own cable TV and phone. 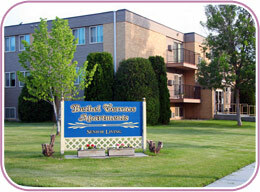 Resident Services are available to all apartment tenants. These services include access to Bethel's Chapel, beauty shop, activities and transportation for medical care. Priority is given apartment tenants when or if admission to Bethel's Arbor House or Bethel Lutheran Nursing & Rehabilitation Center is desired. Residents must be capable of providing for their own personal needs either on their own or by contracting with appropriate support services.